Included with the 5D is Canon's Digital Photo Professional (DPP) program that offers users high-speed processing of RAW images. Rivaling and even surpassing features of expensive, stand-alone and plug-in RAW image processing programs, DPP streamlines professional photographers' workflow, providing time and labor saving options such as instantaneous RAW image adjustment display and support for .CR2 and RAW .TIF as well as Exif TIFF and JPEG formats. DPP is compatible with multiple color space settings including sRGB, Adobe RGB and Wide Gamut RGB as well as Color Management Settings using ICC profiles. Among the array of processing options provided by DPP are color channels, tone curves, exposure compensation, white balance, dynamic range, brightness, contrast, color saturation, ICC Profile embedding and assignment of monitor profiles. Another new feature sure to be embraced by DPP users is the program's ability to allow continuous editing while batches of previously adjusted RAW files are rendered and saved in the background. Among the numerous features DPP provides is the capability to save multiple adjustments to an image as a "recipe" that can be reloaded and used again or applied to other images. 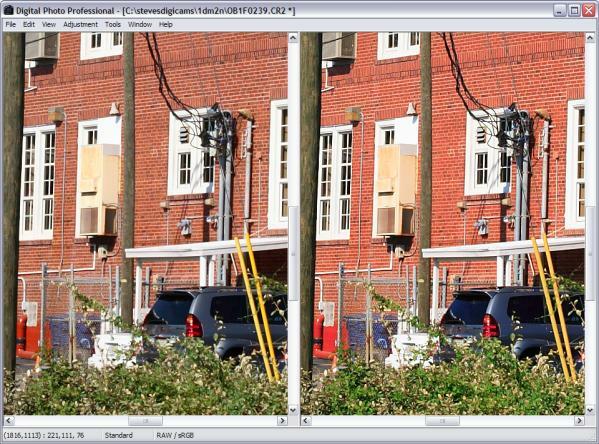 In comparison mode, original and edited images can be compared side by side or within a single split image. File save options are: Exif-TIFF 8bit, TIFF 16bit or Exif-JPEG with selectable image quality (scale of 1 to 10). CameraWindow supports the tethered download, configuration and operation of the 5D when connected to your computer via an USB cable. 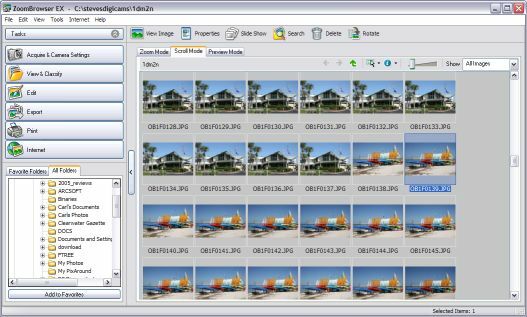 Images can be selectively downloaded, offering you a view of a shot's histogram and shooting data. 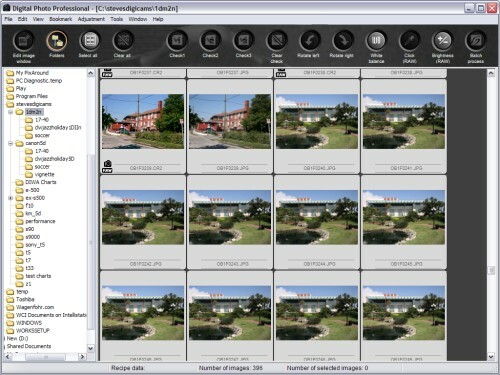 CameraWindow can set the 5D's DPOF parameters, upload images to the camera, and modify camera settings. CameraWindow can modify the 5D's Picture Style settings and upload new Picture Styles when they are provided by Canon. CameraWindow invokes EOS Capture to perform remote shooting. 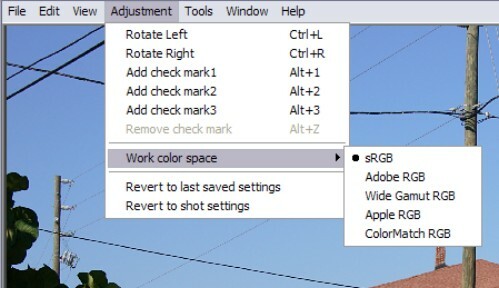 Exposure parameters can be set and the shutter button "depressed" from your computer. Canon recommends use of the upgraded Zoom Browser software if you mainly shoot JPEG images. It provides scrollable thumbnail view to help you find images you want to process as well as a preview mode that display's shooting information. Double clicking on a thumbnail brings up an edit window, where you can correct red eye, adjust brightness/contrast, adjust sharpness and trim the image. 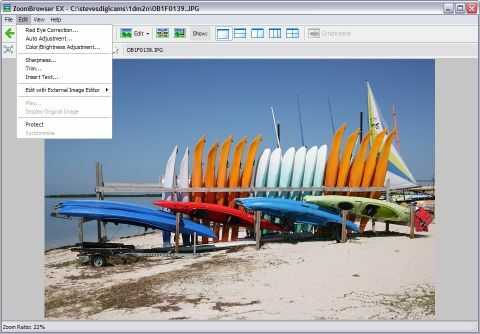 Edited images can be saved as JPEG, TIFF files, or BMP for use as wallpaper.